The last time a running back on the Detroit Lions rushed for 100+ yards was Reggie Bush on November 28, 2013. He did it three times that year. Since then, just six running backs for Detroit gained at least 90 yards! Detroit had gone 70 consecutive games without a 100 yardd rusher, the longest such drought by any team. That all changed on Sunday Night Football, as rookie Kerryon Johnson gained 101 yards on 16 carries against the New England Patriots. 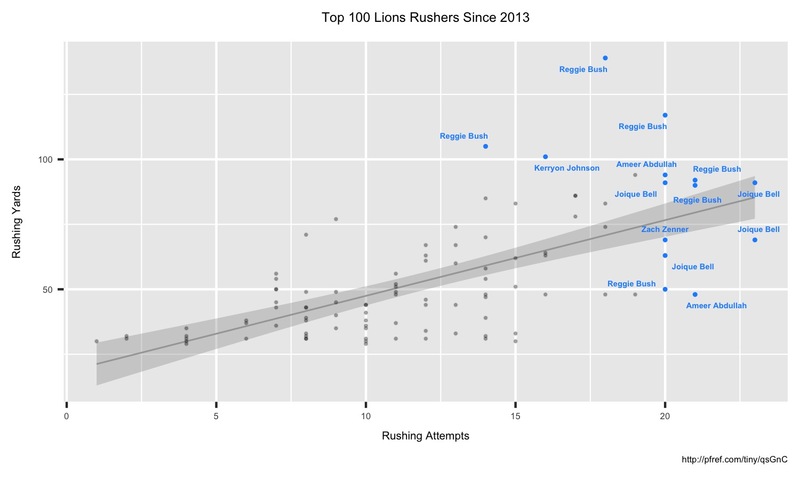 The chart below shows the top 100 rushers for the Lions since the 2013 NFL season. It has been such a struggle that only 11 times in over five seasons did Detroit even hand the ball off 20 times to a running back! Kerryon Johnson broke off four runs for 10+ yards on Sunday Night.